In the same way that a psychic is to a medium I believe Psychic Phenomena and telekenesis is to Physical Mediumship. A psychic is using those natural talents inherent, even if they have been ignored or unexplored, within all of us. If you like it is becoming sensitive both to our own energies and the energies around us and to become sensitive to all the information available to us. I will go into this in the forum on psychics but I also believe it is touched upon in the forum Spiritualist Philosophy and the topic regarding the Triune Man. Again a psychic is just using the energy that surrounds them and their natural gifts. They are perceiving this and passing on information gathered from this natural physical world which we live in. A medium heightens there awareness further and opens a different channel to another level at which they can be in contact with our loved ones in the spirit world. This contact, proved by the evidence the medium gives from the connection with a loved one is what makes mediumship. This is the same with mental mediumship and physical mediumship. The Mental Medium translate what they receive (either objectively or subjectively by clairvoyance, clairaudience, clairsentience or intuitive knowing) and passes it on to prove they have contact. For a Physical medium we are looking for direct voice where the mannerisms, memory and vocal style are unmistakeably the person or by materialisation. Obviously for the latter to be of real value it must be in the light so that the recipient can see and confirm the identity. Materialisation in the dark even if there is a message from spirit but in a voice which does not match is unlikely to prove much as sceptics will always argue it lacks conviction or could just be the medium escaped from restraints (or his accomplice). In both cases there is a middle ground where the communication or effect may be from Spirit but we cannot prove it. Is it a spirit levitating the trumpet or the combined psychic energy of the group channelled to create the movement. Is the information I am getting as a mental medium, which seems to be outside my understanding, psychic or my guides. Neither can emphatically be atributed to the work of Spirit. I have heard an argument that of course it is spirit because all facets of life reflect Spirit, I reject this because all facets incorporate elements such as murder, that I hope lie outside of this influence. Additionally there are those who try to use psychic powers for their own purposes and I believe that this goes beyond Spirit to. There is a borderland between Mental and Physical mediumship trance and transfiguration. Clearly if it is recognisably a loved one then it is mediumship but in Trance Testing the Spirits becomes vital. It is no good to just accept what happens and who comes through. They need to be in a position either to prove their claim, or provide information which is independently verifiable, or to illuminate the group with wisdom which not only appears profound but can be generally accepted as such (as Silver Birch). Without this trance could be alter ego, low level or personating spirits creating mischievous and misleading results. So in this forum we have a middle ground, one where physical phenomena can exist outside of Spirit Intervention. In here goes dowsing, levitation, flying objects, apports, spoon bending, table tipping, planchettes etc. It probably includes areas of EVP but this also crosses provably to Spirit communication at times. My own experience of table tipping was suggestive of Spirit involvement but not conclusively so. Yes the table leaped about at a rate to create a danger to all and sundry. It obeyed directional commands but we did not achieve communication. I am a dowser and I acknowledge that this works but it is not by a connection to Spirit it just seems that the activities involved opens up the energetic channels and natural consciousness. Now the Rev Anne Gehman, who visited us fom the USA, is an ace spoon bender and she linked this into a healing course showing, prior to linking to Spirit for healing, the natural power available to us if we work as a magnetic healer. 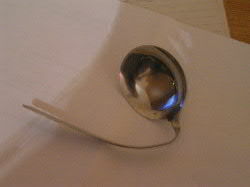 The bends and twists in this spoon occured without linking to Spirit, once I had tuned my natural energies and those within the molecular structure of the spoon. So folks this area is to discuss those things which could very well be natural not Spirit. Like I say to people who start giving messages when they have not proved who it is from ...do not say they are telling me unless you know and can prove who they are. Same rules in the world of Physical phenomena. I would be interested in members comments about my account of an experience I had at a workshop run by a physical medium. Is it Spirit involvement, or is there some other sensible explanation ?
" At my third workshop, at a village hall near Basingstoke on 18th August 2012, the attendees took it in turn to sit in the cabinet in red light for a transfiguration experiment. When it was my turn to sit in the cabinet, I sat quite still with my eyes closed and let myself go in to a kind of meditation. I had no idea there was anything over my face, although I felt itches and tingles at times. My eyes were closed throughout, and I could hear all that was said in the room, although I felt I was in a bit of a dream state. A photo was taken, and showed a large lump on my face which wasn't there before. I heard the group talking about the cabinet moving. My scientific detachment was breaking down somewhat! In the same period as the photo was taken, other things were happening to me and the cabinet. There was a strong red light in the cabinet, and the room was darkened with curtains but we could see each other well, as it was daytime. As I do not consider myself mediumistic or psychic, I did not bother to get someone else to camcord me in the cabinet. I sat with closed eyes and kept very still throughout. I let myself go in to a kind of meditation with an open mind, and I could hear comments that my face was changing. I did feel some itches and tingles on my face, but I've had those before in spiritual situations. Suddenly, I heard remarks that the cabinet was moving, and it seemed that all could see this, except me of course. There was excitement in the room, and the others began to talk to the cabinet, or rather if there was a communicator causing the movement. A code was established of sideways movement for Yes, and backwards and forwards for No. Questions were then asked if the communicator was male (yes), was he wanting to contact someone here (yes), was the person to contact male (no), female (yes). A relative (yes). Did you pass over more than ten years ago? (yes). There were three candidates left. Dark hair? (no) or fair hair? (yes). The only person who was left was my fair-haired sister, who was in attendance. My sister accepted the communicator, but said nothing at first. Others asked, is it a grandfather? (no). Is it father? (no). My sister then asked, is it Ray? ( Our brother ). The answer was an emphatic yes, shown by lots of sideways swaying movement. I was feeling very emotional by now. My sister asked, Are you happy where you are? The answer was yes. She was rather taken aback, and asked nothing else. I might add that I had no sensation that the cabinet was moving, as my eyes were closed throughout and I was a bit dreamy, but I could hear the voices and understand what the attendees were saying. I confirmed the facts with the other attendees, who said the cabinet movements were very pronounced, and we all knew that no fraud was possible. They also said that my face had some kind of lump on it, when they looked at me. Although this, like table tilting, is a basic form of communication, it proved once again for me that the 'paranormal' is a reality, and there was an 'intelligence' behind the answers to questions. Beyond that, I think it's a matter of personal belief and interpretation. " Jo Winstone, one of the attendees , says: “I can confirm everything Norman has said. It was wonderful to see his face transfiguring, and I'm so pleased the communication was for him and his sister.” Other attendees confirmed what they saw and heard, in a way which satisfied me that it was not mass suggestion, the photo proved the formed 'lump', and I think it was extremely suggestive of Spirit because there was no physical contact with the cabinet to move it purposefully, and was it coincidental that the replies to questions led back only to my sister?